This charming neighbourhood restaurant is the place to go for authentic Italian cooking. 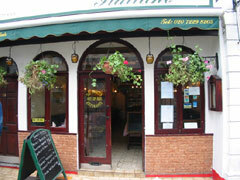 The décor is warm and relaxing and this restaurant offers the charm, warmth, and friendliness of the Italians. The ambience here is laid-back and friendly in the traditional Italian style. The menu is full of enticing wholesome Italian dishes with favourites to please everyone from pizzas to steaks, pasta to fish. The pizza dough is made fresh every day and the menu offers an extensive array of mouth-watering pasta dishes. Classic mains include entrecote al pepe steak with black peppercorns, cream & brandy sauce and trota alla mugnaiai river trout in butter & lemon sauce. The wine list is exclusively Italian and features the classics like vino nobile del montepulciano and Chablis - Simonnet febvre. The staffs are attentive and will make you feel right at home. De Amicis is a superb choice for dining out with friends, a romantic evening, or just for those homesick for Italy. A must go for all Italian food lovers. The black board in this restaurant is frequently updated with a varied selection of daily and season specials, complementing a well-balanced standard menu.